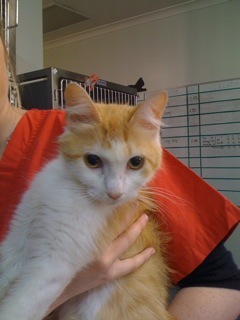 Sweet young Turkish Van X female - finally found a home. Could you give a home to sweet Annabelle? Annabelle came to us with her two kittens. They were all starved and she was trying to survive and to feed her young in a starving state. She did well and they are all still alive and well. Annabelle is a lovely girl. Could you give her a home? She has been desexed, blood tested, microchipped, dewormed and vaccinated.